Click on the pictures for a larger viewing. Rev. John Blaise Raho purchases lot between Madison and Jefferson Street for $100. Rev. John Drew is appointed the first pastor of Peoria. Rev. 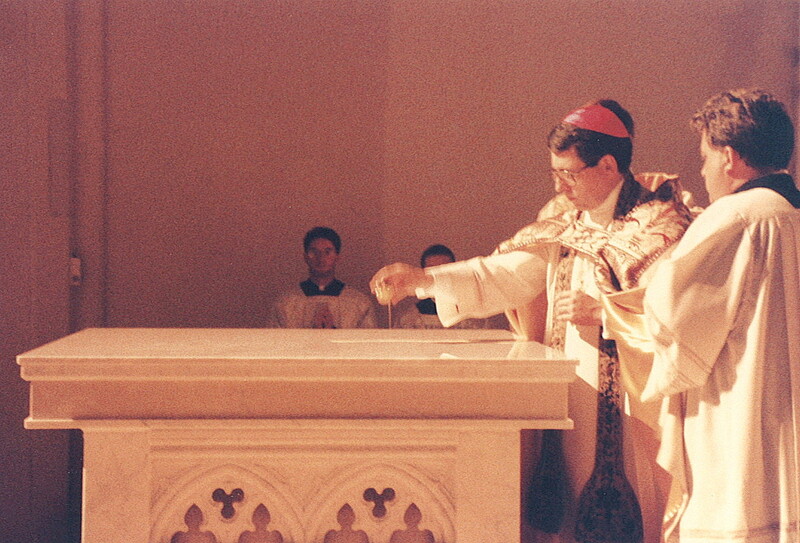 Louis Parodi, C.M., lays cornerstone for first Peoria parish church of St. Philomena, dedicated to St. John the Evangelist. 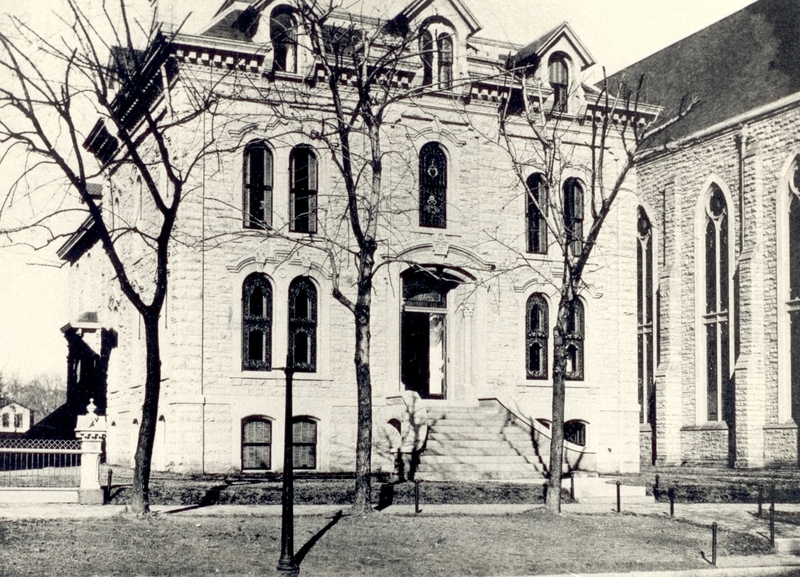 It is a small one-story brick building, twenty-eight by sixty feet. Rev. Alphonse Montouri, C.M., lays cornerstone of the new St. Mary Church on the corner of Eaton (now Bryan) and Jefferson Street, replacing the old small church. 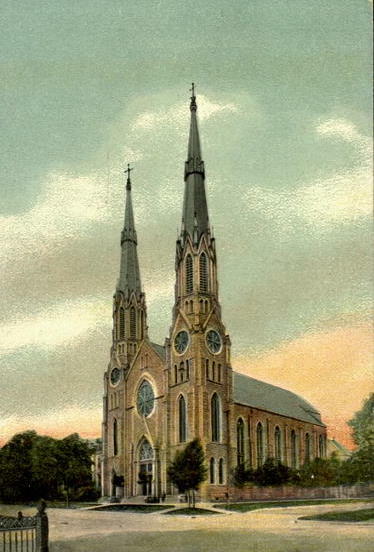 First services in St. Mary Church are held. After the church’s tower has been demolished by a storm, a new brick tower with four small spires on the corners is erected. At this time, there are about 2,000 members of St. Mary Parish. Bishop John L. Spalding is installed as the first Bishop of Peoria. Rev. Benedict J. Spalding, Bishop’s brother, becomes pastor of St. Mary Church. Bishop Spalding purchases a lot on the corner of Madison and Green Street for $6,500, assuming $2,500 mortgage on the property. Peoria Architect Casper Mehler submits plans for a new gothic stone church. First stone of the building has been laid. Bishop Spalding lays cornerstone for the new Cathedral in Peoria. Rev. 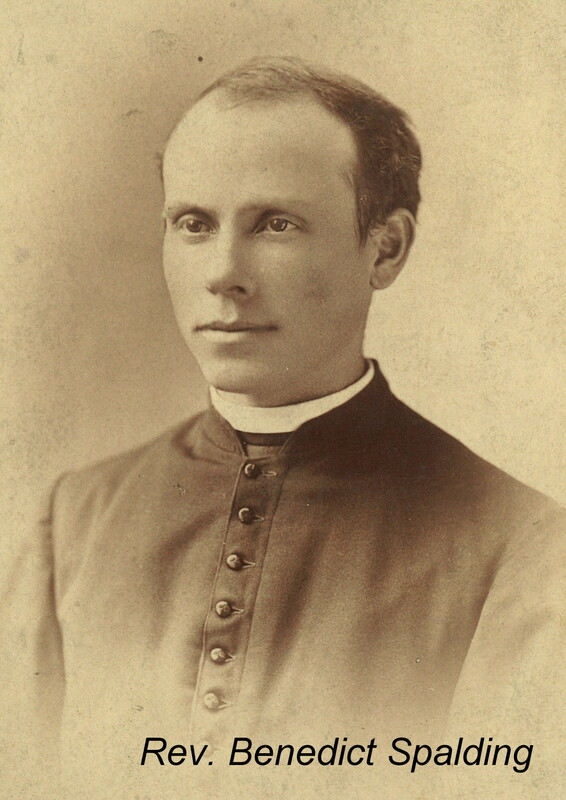 Ben Spalding, the pastor of St. Mary, personally directs and supervises the building of the Cathedral. Peoria Steam Marble Works has installed 14 highly polished Barre Vermont Granite columns. They are 28 ft 8” tall and 20” in diameter. Each column costs $3,650. Sandmeyer Hardware Co. of Peoria has made the crosses for the Cathedral spires. Rev. Ben Spalding becomes ill. The work on the Cathedral slows down considerably as he leaves for his home in Kentucky due to his health. Rectory next to the Cathedral is being veneered with the same stone as the Cathedral. Rev. Ben Spalding dies at the age of 38 due to a lung disease and overwork. 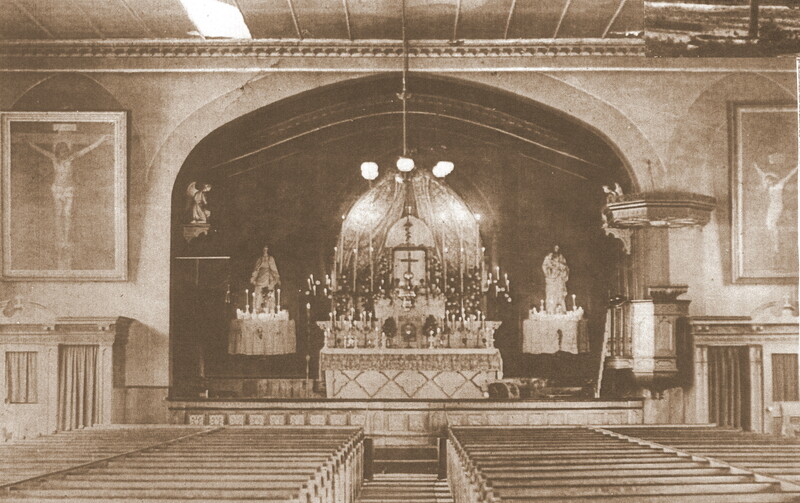 Sacristy is finished and being used as a chapel for daily Masses, while the old St. Mary’s is still used on Sundays. 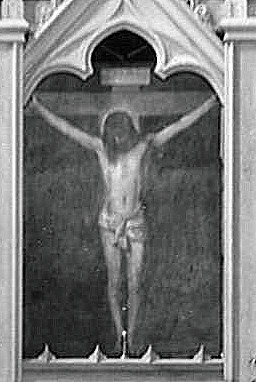 The painting of the Crucifixion from the old St. Mary’s is installed above the main altar in the new Cathedral. Stained-glass windows are being installed by a Chicago company. Pews are being put in the new Cathedral. The flooring, sanctuary, and communion rail are all made out of wood. 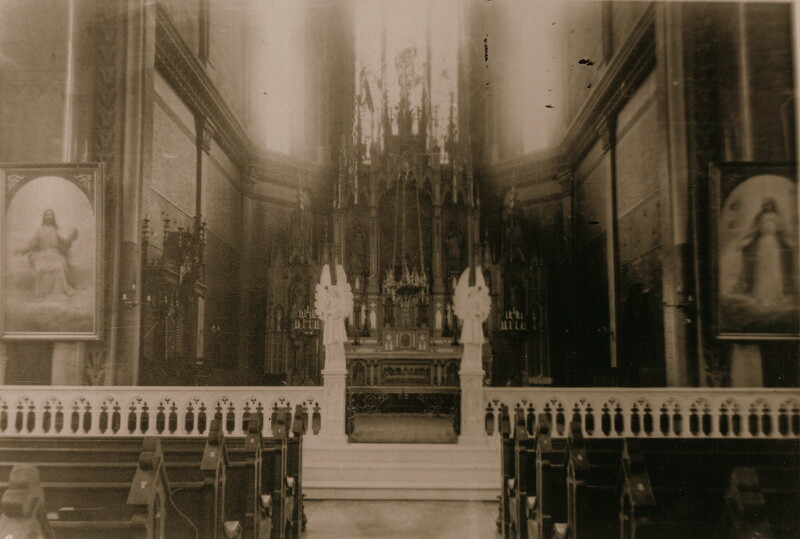 The church is lighted by candles and gas lights. Exactly four years after the first stone had been laid, the new Cathedral is solemnly dedicated. 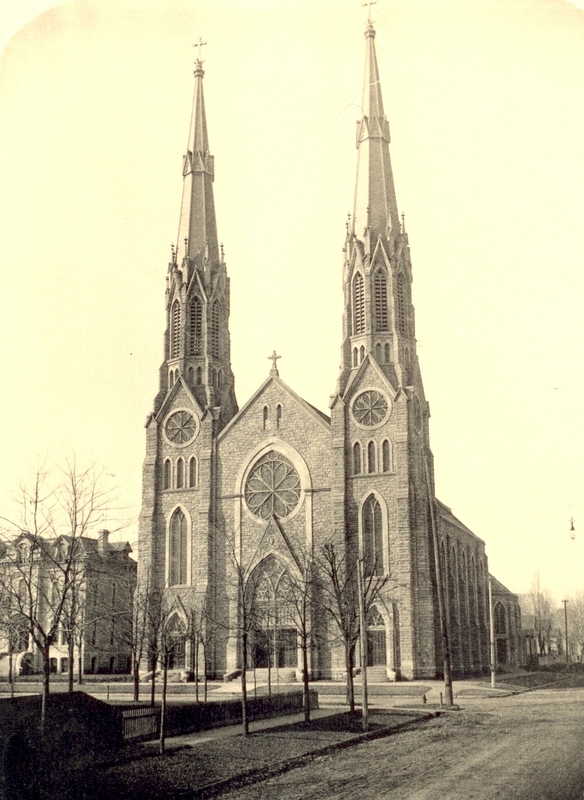 After the old St. Mary’s has been torn down, its bell is placed in the South Tower of the new Cathedral. The bell was cast in Troy, NY, in 1884. New white-marble communion rail, steps and two angels are donated by Mrs. Henebery. 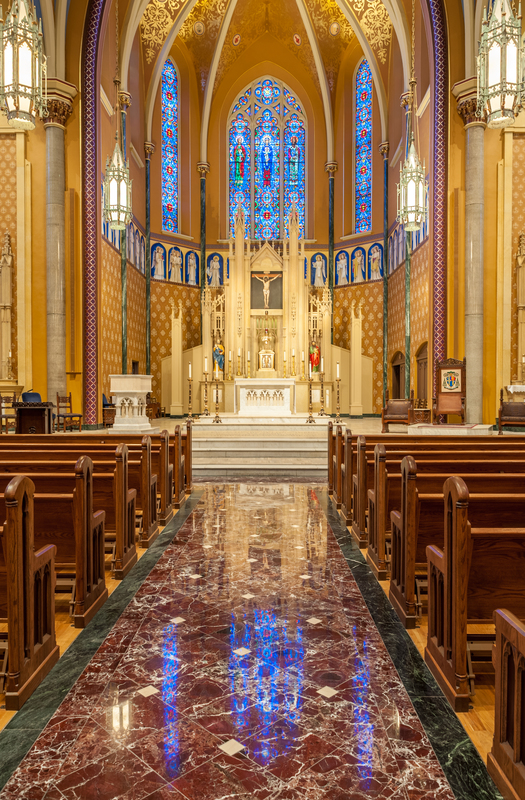 Bishop Edmund M. Dunne redecorates the Cathedral for Archbishop Spalding’s Golden Jubilee: three marble altars and two new stained-glass windows depicting Life of Mary are installed. 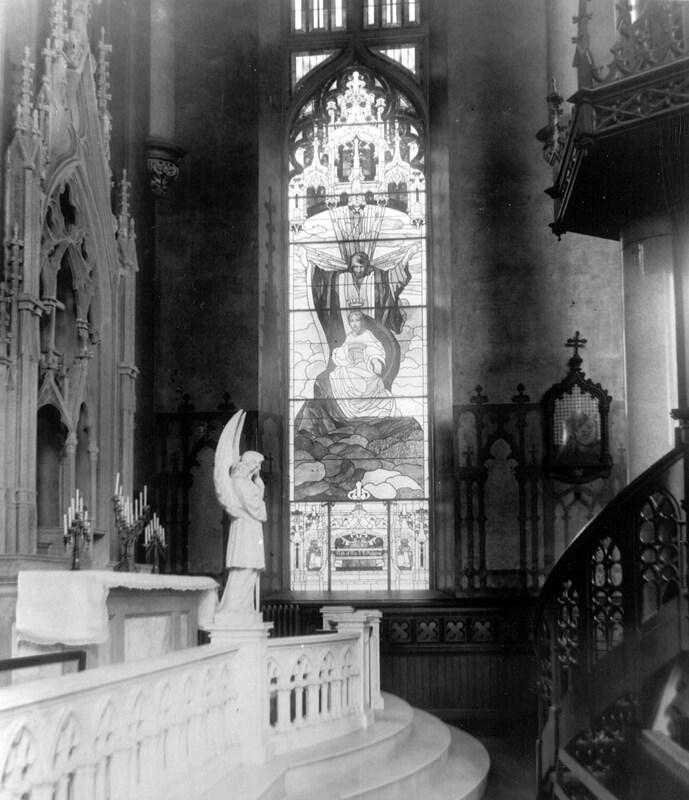 Remaining 10 windows done by a Chicago artist Mr. Lascelles are being installed in the nave. All windows were donated by priests of the Diocese. 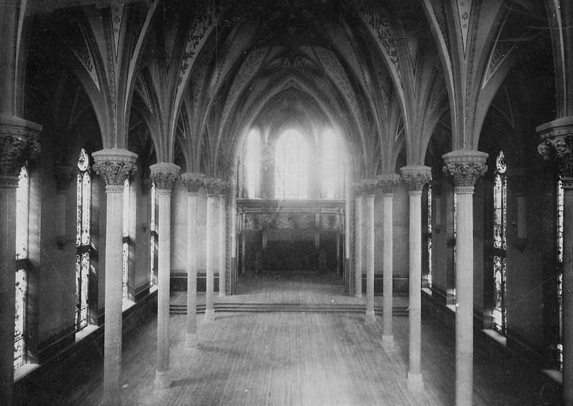 Bishop Joseph H. Schlarman corresponds with Ralph A. Cram, an expert on Gothic design, on the thorough renovation of the Cathedral. Architect Cram makes sketches for the restoration. Severe economic crisis in the country delays the renovation of the Cathedral. Bishop Schlarman’s renovation called “Redemption” begins. 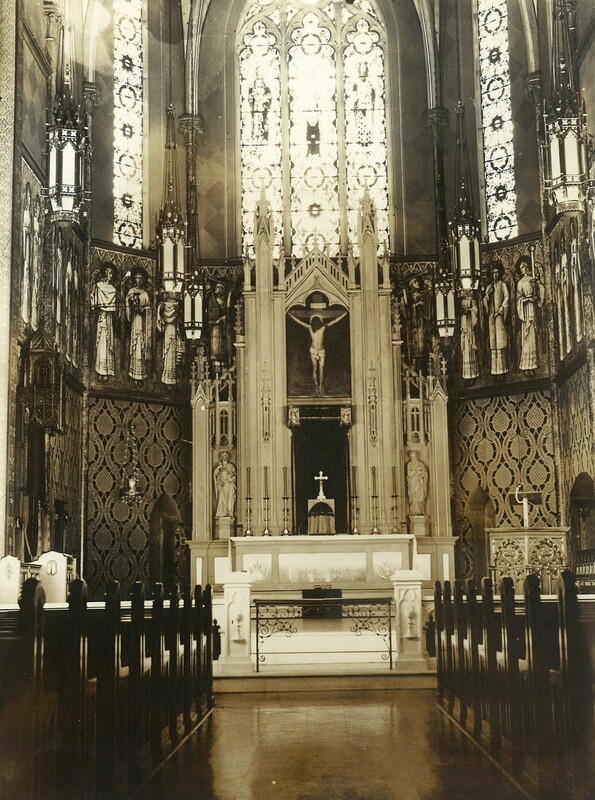 St. Louis Architect Victor J. Klutho has designed the Sienna Travertine Marble tile floor in the sanctuary along with the choir stalls and pews. Watson Engineering Co. of Peoria, IL, has installed new capitals on the Cathedral’s twelve granite columns for their better proportion. Kaletta Statuary Co. has completed the laying of the sanctuary floor made of Sienna Travertine. Sixteen (16) large and twelve (12) small unique lanterns designed by Ralph A. Cram and made by the Kinsley & Mahler Co. of Peoria are installed. New cooling system donated by Mr. H. Dox is being installed, and it served until 1986. 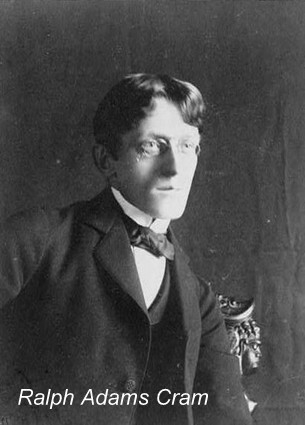 Wilbur H. Burnham is commissioned to do all stained-glass work for the Cathedral. Construction of the Lady Chapel, the narthex, stairs and two galleries has been completed. New organ is dedicated to the memory of Bishop Spalding and Bishop Dunne. Fr. 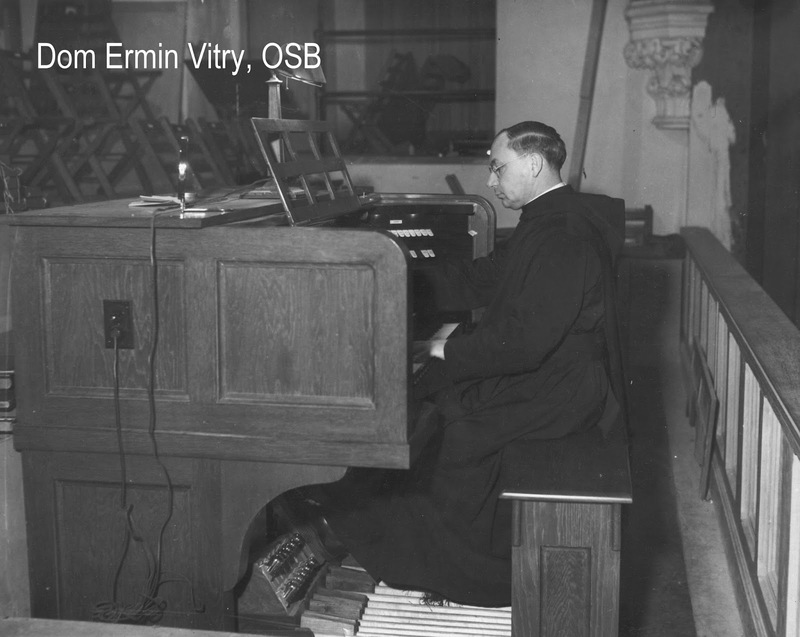 Lyford Kern and Dom Ermin Vitry, OSB, personally supervises the construction of the organ at the Wicks Factory in Highland, IL. Great Rose Window and new huge wooden entrance doors are installed. Bishop Schlarman privately dedicates the Lady Chapel and erects the Stations of the Cross there. Mr. Schiller restores the painting of the Crucifixion. 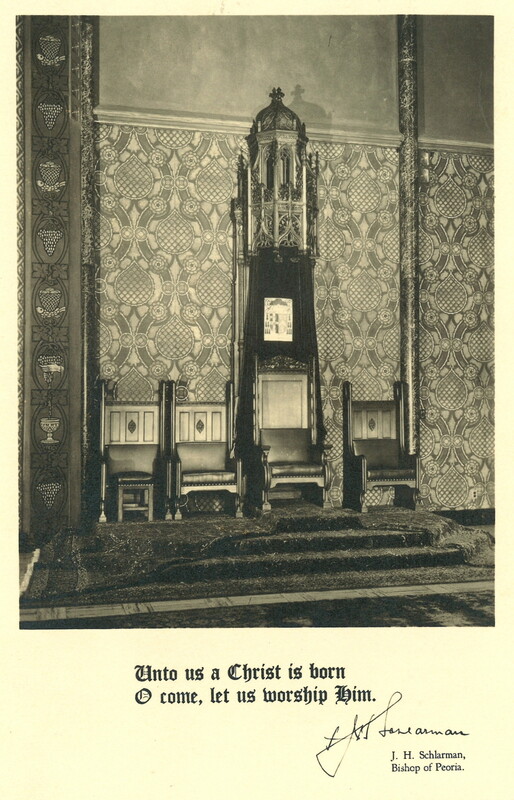 Throne for the Bishop, donated by clergy, is installed in the sanctuary of the Cathedral. 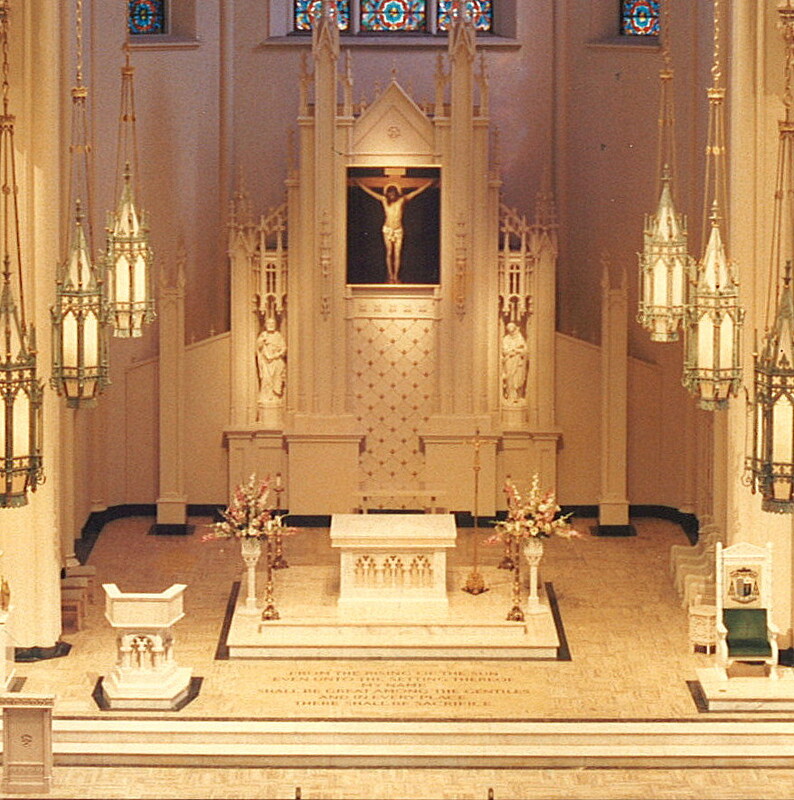 A new bronze, triple gold-plated sanctuary lamp is installed. 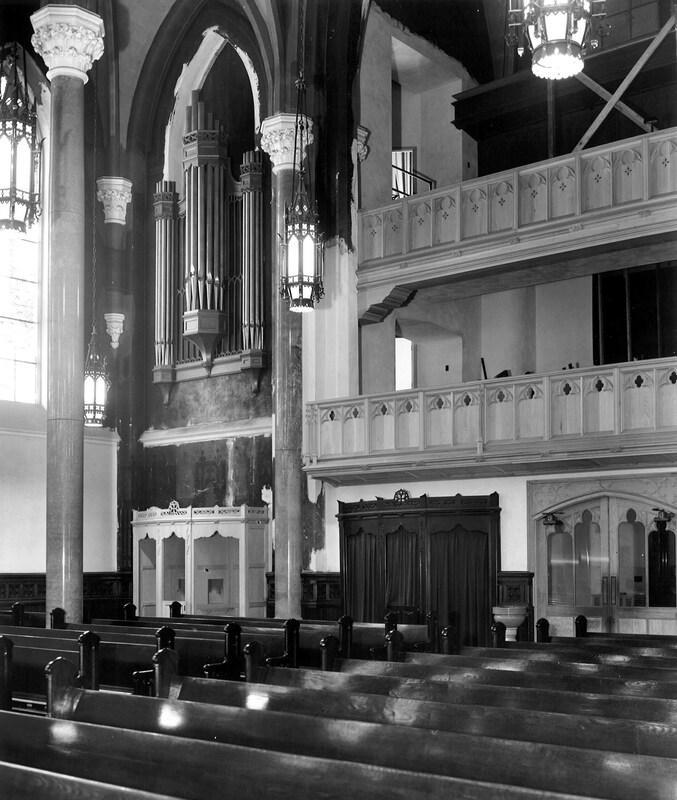 Old wooden pulpit that hung from the second column is cut down to a smaller size and placed on the sanctuary floor. The Cathedral spires are being repaired by the Val Jobst Co. of Peoria. The new stained-glass windows of St. Thomas More Chapel are all in place and the frescoing of the sanctuary is complete. Four remodeled altars are consecrated. Present windows in the nave and a new sound system have been installed. Frescoing of St. Thomas More Chapel completes the extensive “Redemption” renovation under the personal supervision of Bishop Schlarman. 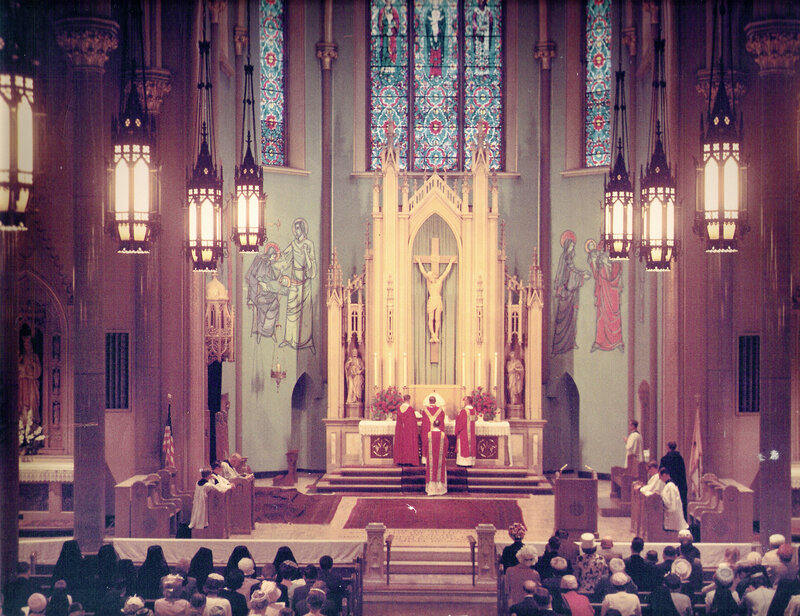 Bishop Cousins redecorates the sanctuary and the nave, pews are restored, and the painting of the Crucifixion is replaced with a hand-carved crucifix. 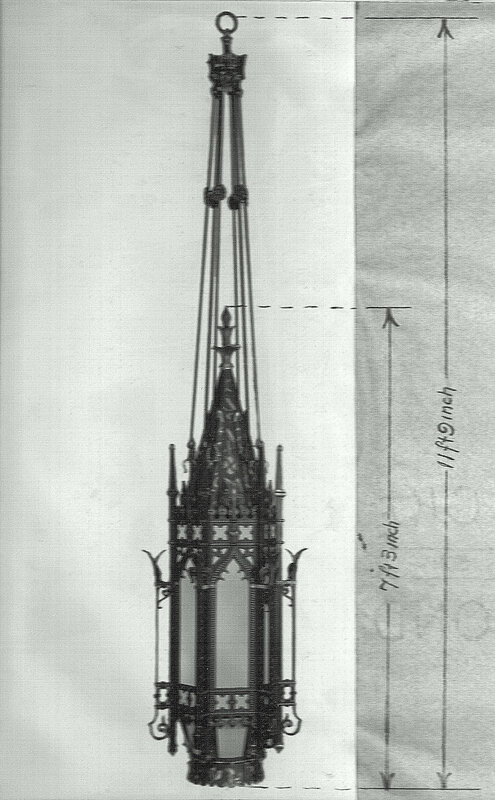 Original crosses on the Cathedral spires are replaced with two shining golden crosses. Both spires are being repaired and painted by the Harry Geisert Co. of Breese, IL. Dwight Roofing Co. is replacing all metal and wood on the spires with all new copper. All wooden window frames on the spires are replaced. New heating system is installed by the McQuellon’s Heating Co. of Peoria, IL. Peoria Thermal Co. is installing new air-conditioning units in the Cathedral. Jenkins Organ Co. of East Peoria, IL, has completely cleaned the Cathedral organ and replaced its parts. 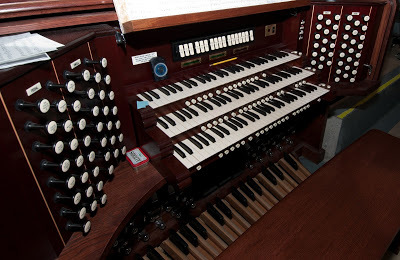 At the cost of $11,850, the Cathedral organ is being totally redone by the Schlicker Organ Co. of New York. Cathedral spires are now lighted. Sixteen window frames of both towers are being replaced. 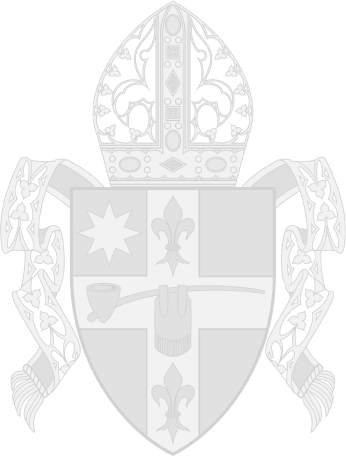 Bishop O’Rourke renovates the Cathedral. The Lady Chapel is made into a Blessed Sacrament Chapel. The marble communion rail is used for a new altar and ambo. 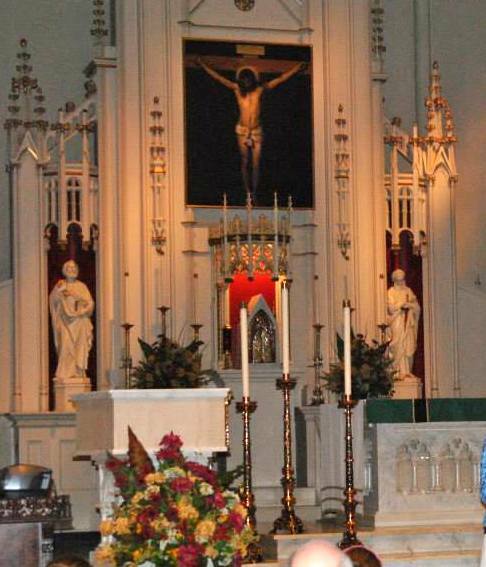 The painting of the Crucifixion is re-installed above the main altar. The outside of the church was completely renovated, and on the north side a ramp for handicapped was added. The Cathedral is being re-dedicated. Bishop Jenky moves the tabernacle back to the sanctuary. 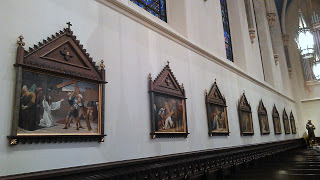 The gold-leafed triptych of Bishop Schlarman returns to the Lady Chapel. 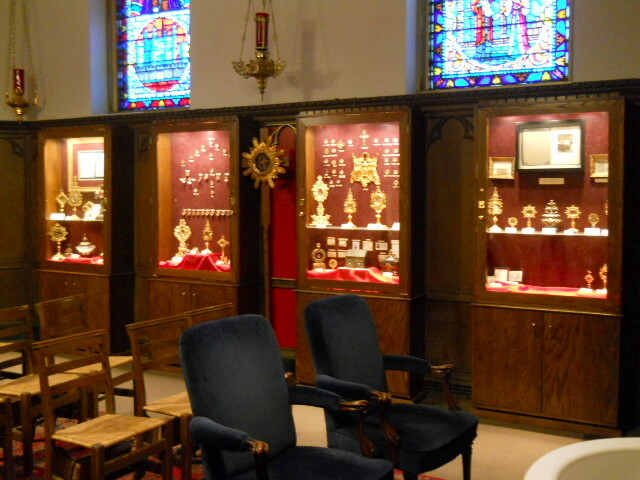 St. Thomas More Chapel is being transformed into a Cathedral Collection of Relics. Cathedra (Bishop’s Chair), sanctuary and pews are restored. 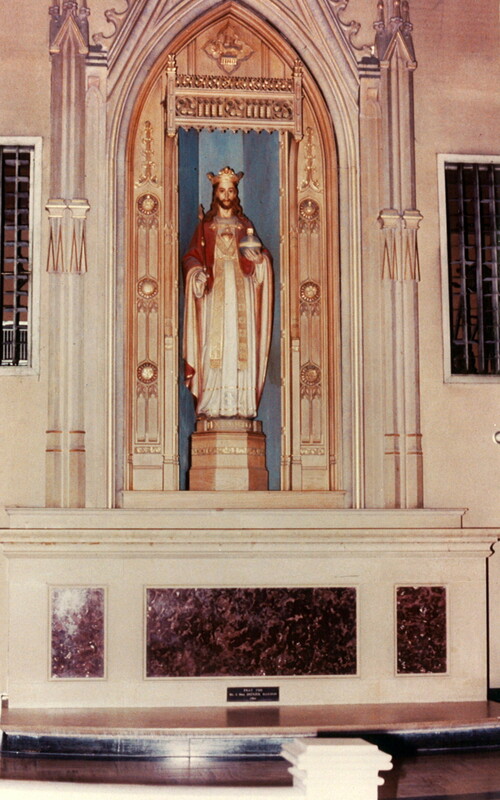 Restored traditional Stations of the Cross are installed in the nave. 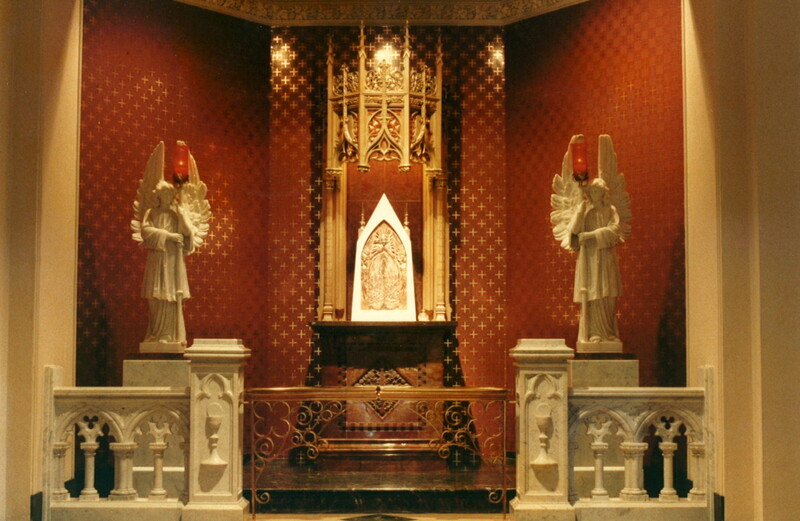 St. Joseph’s Altar is remodeled. 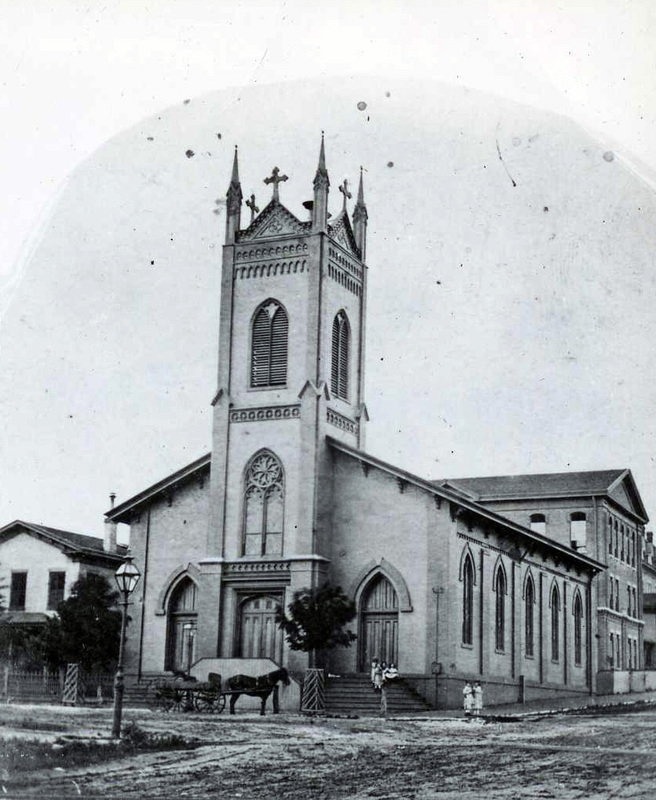 On the 130th anniversary of arrival of our First Bishop John L. Spalding, the diocese is rededicated under the patronage of Our Lady of Perpetual Help. 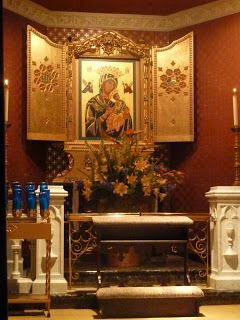 Her image is solemnly enthroned by Bishop Daniel R. Jenky, C.S.C., in a gilded triptych in the Lady Chapel.